"this award recognizes the efforts and accomplishments of those who have made significant contributions to bringing us closer to realizinging Annette's dream and the mission of the AFRFND". Jim Shaw was presented The Annette Funicello Award on June 23. 2015 in recognition of his voluntary role as Executive Producer on Annette's "Tribute to Walt Disney" CD. Released in December of 2013, the two-track CD had raised an excess of $150,000 for AFRRND at the time he was presented the award. Copies of the CD continue to sell, with the full result of his volunteer efforts on behalf of neurological research yet to be realized. 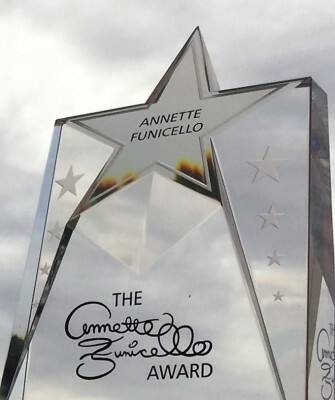 Sarah Slayton-Price was presented The Annette Funicello Award on June 23, 2015 in recognition of her work as the graphic designer for Annette's "Tribute to Walt Disney" CD. Sarah volunteered her talents to the project, creating the custom artwork used on the CD pacakging and additional art for use in promoting the release. Released in December of 2013, the two-track CD had raised an excess of $150,000 for AFRFND at the time she was presented the award. Copies of the CD continue to sell, with the full result of her volunteer efforts on behalf of neurological research yet to be realized. Dr. Paolo Zamboni was presented The Annette Funicello Award on June 4, 2016 in recognition for his development of "brain drain" experiments that were carried out aboard the International Space Station, Expedition 42/43 in 2015. Zamboni, a professor at the University of Ferrara (Italy) in the Department of Morphology, Surgery and Experimental Medicine and director of the Vascular Diseases Center, developed a small instrument that can accurately measure blood flow back to the heart from the brain. It is believed that this same device may be of great benefit to millions on earth by easily and effectively detecting obstacles within the veins obstructing blood flow from the brain back to the heart; which is believed to be a contributor to neurodegenerative conditions like MS, Parkinson's and Alzheimer's. Included with his trophy, the AFRFND presented Dr. Zamboni with a $10,000 grant for further development of the Strain Gauge Plethysmography collar and tilting chair in hopes it will soon be available for the benefit of patients suffering from neurological disease soon. Italian Space Agency Astronaut, Samantha Cristoforetti was presented The Annette Funicello Award on June 4, 2016 in recognition for her participation in the "brain drain" experiments, as developed by Dr. Paolo Zamboni and conducted aboard the International Space Station, Expedition 42/43 in 2015. While conducting these experiments, Captain Cristoforetti's extended mission became historic when she secured the record for the longest single space flight by any woman, spending 199 days 16 hours on the International Space Station.